PCY14-1B Series Variable Axial Piston Pumps FeaturesConstant pressure variable axial piston pump PCY14-1B is the use of the oil pan with oil, cylinder rotating axial piston pump. 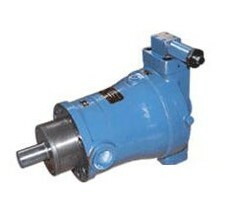 Constant pressure variable axial piston pump PCY14-1B due slipper and variables between the head, between the oil pan and cylinder block using a hydrostatic equilibrium structure, and therefore compared to other types of piston pump, constant pressure variable axial piston PCY14-1B has a simple structure, small size, high efficiency, long life, light weight, self-priming ability, etc.. Constant pressure variable axial piston pump PCY14-1B for machine tools for forging machinery for metallurgy Machinery for construction machinery, mining machinery suitable for wind power generation machinery and other hydraulic transmission systems. Constant pressure variable axial piston pump PCY14-1B just replace the motor with the oil pan can also be used as a hydraulic motor.